Watch for an official Virtual Reality walk-thru exp erience soon of the National Register Lutze Housebarn! 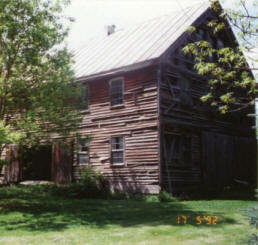 The Lutze Housebarn was built in 1849 by Gottlieb and Fredericka Lutze. The building is dual house and barn under one roof in the Old World German Tradition. This three floor timber structure with brick fruit cellar, is on the National Registry of Historic Buildings, listed as nationally significant, and is being considered as a National Landmark. It is one of three known buildings of its kind in the United States, according to the Director of the National Parks Service. It was also listed in 1994 as one of the ten most endangered buildings in Wisconsin worthy of preservation by the Wisconsin Trust for Preservation. The Lutze Housebarn is part of an Old World courtyard style farm yard that is representative of the tradition of the entire Centerville area. The half timber style Housebarn is unique for its fechtwerk construction and its size. The family lived on the east end and the livestock on the west end of the building. Large animals were housed on the main floor as well as the cooking activities. As heat rose, it helped to warm the smaller animals and bedrooms on the second floor. The third floor was used for straw and hay storage that acted as insulation. Centreville Settlement, Inc. is restoring the building to the 1880’s. The majority of the work has been done by dedicated volunteers. A goal of the restoration is not only preservation of the building but the preservation of the building skills and techniques needed to construct the original building. The Lutze Housebarn restoration is the only known project that invites visitor and volunteers to hands-on learning of timber framing, stone masonry, joinery, timber shaping, interior preservation, artifact cataloguing, etc.. Visitors have participated in an archeological dig, documenting for the National Archives, documenting and stored artifacts, and are learning heritage orchardry. They have worked with original tools shaping timbers or placing stones. They have participated in the camaraderie of a work day as the settlers may have experienced, and enjoyed many a communal farm style lunch. We hope you can come and work with us, share your talents, learn new things, and enjoy the satisfaction of knowing what a difference you can make! !